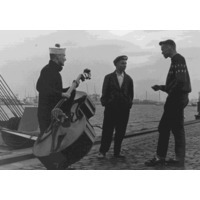 Batmobile is a Dutch psychobilly band from Rotterdam and Breda, formed in 1983. They were the first band not from the United Kingdom to perform at the influential psychobilly club, Klub Foot and are considered the seminal Dutch psychobilly band. Batmobile was formed as a hobby in 1983. The band continues today with the founding lineup of Jeroen Haamers on vocals and guitar, Eric Haamers on bass, and Johnny Zuidhof on drums. The band played only covers of early rockabilly and rock and roll by Elvis Presley, Gene Vincent, Chuck Berry, and Johnny Burnette. The band is named after the Batmobile, the car driven by Batman. The name was suggested by Zuidhof who presented the idea for the name during band practice. The band began playing various gigs at bars and one time, while playing a bar in a rural area, the band received a bad response from farmers who were at the bar. The band began playing covers extra fast, in a punk rock style to get everyone's attention. Bar staff and some patrons enjoyed the music and the band started playing psychobilly shows. Their debut self-titled EP was released in 1985 on Rockhouse/Kix4U.